Today started out as an uneventful travelling day. It ended a little differently. We left the campground at 10:00 am and within two miles we were in Idaho. Travelling along Hwy 15, there wasn’t much to see. It’s mostly fields of wheat and potatoes, or pastures for cows and horses. There was one small section, about five miles long maybe, which looked like the badlands – black rocks tumble weeds and scrub brush. By mid-afternoon the colourful mountain ranges of Utah began to appear on the horizon. Through the open window I could smell rain, and looking towards the east we saw the black cloud of rain emptying over the mountain. The valleys could have used some of it. There were many sprawling ranches where the huge irrigation systems were working full time. At 4:15 we crossed into Utah and we were only an hour away from our day’s planned destination, Salt Lake City. We stopped at the Information Centre to get a list of campgrounds and left with two good options, The Pony Express RV Resort which was new and a ten minute drive out of the city, or the KOA which was inside the city. Both sounded good. That’s when our day began to change. As we got closer to the city the traffic got crazy. I was trying to enter the address of The Pony Express into the GPS while Jim was occupied with the traffic. The GPS couldn’t even find the street! I finally gave up so I could watch for the highway exits shown on the little map on the back of the brochure. We found Hwy 215, and then watched for exit 28. We saw exit 27 and thought the next one must be 28, but the numbers went down! We saw the RV park as we passed over it, so we turned around. By then we’d decided that this one was too far from downtown so we stopped and entered the address for the KOA into the GPS. It took us off the highway at exit 27 and right past The Pony Express RV Resort! We arrived at the KOA at about 6:30 and our very friendly site guide told us about the many things that were available in the park, including a shuttle bus that would take us to the Mormon Tabernacle to listen to the choir rehearse. It only happens on Thursday nights, and the shuttle bus was leaving at 7:10. We hadn’t had any dinner yet so it didn’t look like we could make it. While I made dinner, Jim looked up the directions to the Tabernacle and also found that the practice was from 8:00 to 9:30 and visitors could come and go at any time. It was only ten blocks or so away. We could bicycle. (Jim hadn’t had time to find out what ailed the Virago yet.) After we ate we threw the dirty dishes into the sink and hopped onto the bikes. It was already 8 o’clock but it should take us only about twenty minutes to get there, right? Wrong! The direction map that the RV park had given us showed a route that seemed longer than necessary. The Tabernacle was on the same street as the KOA, so Jim figured that part of it must be a one-way street, making it necessary to go a few blocks around if going by car. Riding bicycles on the sidewalk (there doesn’t seem to be a law against it here) should be no problem. After riding several blocks, we learned the real reason for the round-about directions. The bridge was out! We had to find the way around after all. We were told we should cut through the Gateway Mall, which was two very long blocks away. I think that we’d ridden close to the ten blocks already! After the first block Jim discovered that his bike had a flat tire. We were forced to walk the bikes the last five or six blocks and finally arrived at the Mormon Tabernacle at nearly nine o’clock. Was I glad to see the drinking fountain in the court yard! I wasn’t feeling great by then. Inside the Tabernacle we marvelled at the beauty, but there was no choir rehearsing. We were told that that was happening at the Convention Centre, door twelve, a block further away. We left the bikes where we’d locked them and walked to the Convention Centre. It took a few wrong turns before we found door twelve, but we soon heard the soothing sounds of orchestra and choir. The comfortable seats were a bonus. We could listen only for about twenty minutes before making our way back to KOA. At least it was a nice night for walking. All along the way Jim kept an eye out for an air pump. He even asked other bicyclists that we encountered if they had one with them. About three blocks from our destination he found one at a service station, so we were able to ride the rest of the way. We were doing fine until we noticed the clouds of water up ahead. The lawn sprinklers that had been hitting only the edge of the sidewalk the first time we’d passed were now aimed directly across our path. The road was under construction and traffic was heavy so that didn’t seem to be a safe option. I was in the lead. I took a deep breath and peddled for all I was worth, through the water. My glasses soon became so spotted I couldn’t see through them. I pulled them down over my nose and pushed on past four, five, six sprinklers. Jim was right behind me. We blindly made it through and stopped to wipe our glasses. We were a little wet. By the time we got back to the KOA parking lot, Jim’s bike tire was flat again! We walked to our RV site, having some difficulty finding it amongst the 200 that were there. We had such a good time that we’ve decided to stay here two more nights – to enjoy the Mormon Tabernacle Choir in all their splendour, at the church service on Sunday. We’ll be ready to catch the shuttle bus this time! 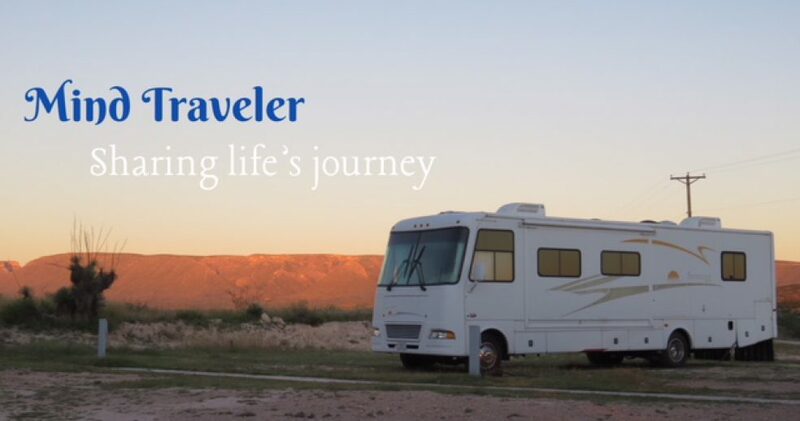 This entry was posted in RV Travel and tagged RVing, Salt Lake City, Utah. Bookmark the permalink.